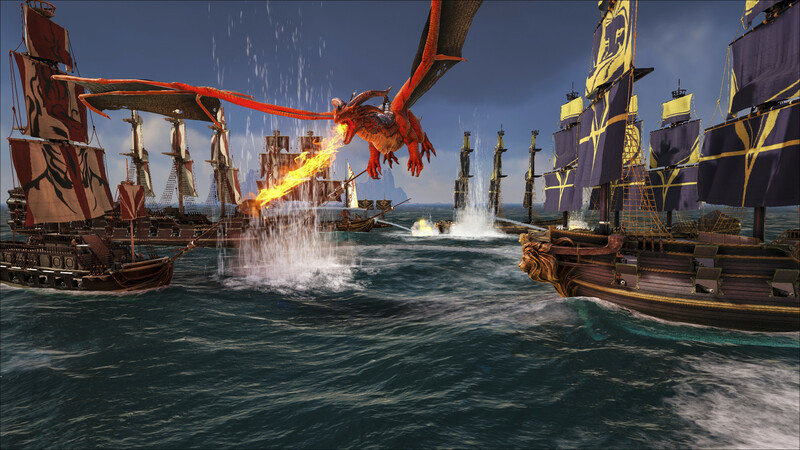 Studio Wildcard has delayed the PC launch for their recently announced pirate MMO ATLAS. The PC version of the MMO will forgo its planned December 13th release for one a bit later, on December 19th. The game will be launching via Steam Early Access. From the creators of ARK: Survival Evolved comes ATLAS – a massively multiplayer first-and-third-person fantasy pirate adventure. ATLAS will host up to 40,000 players exploring the same Globe simultaneously, with an unprecedented scale of cooperation and conflict! Stake your claim in this endless open world as you conquer territory, construct ships, search for buried treasure, assemble forts, plunder settlements and hire crew to join your powerful growing armada. Start small then expand your spheres of influence from a small island, up to an unstoppable pirate empire that spans across the oceans. Wage battle against enemy fleets as you singlehandedly can command large ships of war using the captaining system (or divide up to the responsibilities among your trusted lieutenants), or take control of any weapon directly with your own character. Dive deep into the briny water to explore permanent sunken wrecks and recover salvage, unearth the loot from procedurally-generated Treasure Maps and challenge zones, or complete challenging main questlines. Team up with other aspiring adventurers and sail into the vast ocean to discover new lands rich with region-specific elements, tame exotic natural and mythical creatures, raid forgotten tombs, confront powerful ancient gods and even build and administer your own colonies, cities, and civilizations to dominate the ATLAS in this ultimate quest for fortune and glory! MMO On the Grandest Scale – Physically sail in real-time across throughout the vast oceans with the proprietary server network technology. Explorers will voyage to over 700 unique landmasses with thousands of Discovery Zones, and ten distinct regions each having their own unique resources, creatures, secrets, and environment hazards! Construct the Ship of Your Dreams, Plank by Plank! – Build drydocks and start with a dinghy rowboat, basic raft, tiny sloop or nimble schooner, moving on up to your own versatile brigantine or titanic galleon capable of transporting hundreds of crew and extensive cargo. Name your ship in big bold letters, paint and copy your own pirate flag and custom-place all the pieces of your ship — which sails and where, planks and gunports, every single structure piece has a physical Weight and Material — to function exactly how you want. Captain your Crew! – Recruit real players and AI crew from freeports or rescue seasoned crew from destroyed “Army of the Damned” shipwrecks to man distinct stations on your boat! Set sail and explore the ATLAS with them to gain experience and level up their stats or gear, as well as levelling your Ship. Your crew are versatile! Whether on land, or ship, or even riding behind your animal companions on emplacements, they can man weapons of all kinds– cannons, swivel guns, siege engines, turrets, and even gigantic mortars, many with dynamically swappable ammo types including grapeshot, chainshot, spikeshot, liquid fire, and more! Instruct them to board enemy ships and help you conquer the seas! Keep their stomachs full and their pockets full of gold lest you want a mutiny in your hands! Take on the Captain’s Wheel or divide up the command responsibilities via Lieutenant Podiums to direct the Ship’s assignable weapon systems, sails, and stations, including standing-orders or manual grouped fire. Or, walk up to any station and take control of it yourself! Pirate PVP to the Limit – Everything is up for grabs including player’s ships, their crew, their pets, their forts, their land, and their booty. If you can get your hands on it, you can take it. A ship’s permanent logbook tells the tale of their legendary travel, exploits and ownership. Be the Hero or Villain you were meant to be – MMO-scale character progression systems include, at launch, over 15 Disciplines with over 300 Skills, in a vast unlockable tree. New “Feat” system allows for active and passive bindable character abilities, while new stat-buff system allows innumerable abstract statistics to be modified by Skills, Items, and Armor. And now, everything has scalable stats, including structures, and can be progressively Upgraded! This is Who You Are – Extensive character visual customization enables an endless range of realistic (and not-so-realistic) characters, with a vast array of sliders, morphs, muscle tones, and tweakable values. You can even per-pixel design your own permanent tattoos (and then draw warpaint on top of that too!). If someone exists in the real world, they should be creatable in ATLAS! Best-in-class dynamic hair growth and real-time aging systems allow you to get old and… pass on your legacy? (Or find a fountain of youth!). Endless Adventure – Full Quest and Waypoint systems, with sub-quests and rewards, for major goals — while procedural treasure maps and challenge zones also ensure there’s always something new to find out over the horizon. Intense Action – Tactical melee combat systems with blocks, parries, dodges, character motion, optional shields, stunning and strength-varying strikes, directional attacks, and more for use in either first or third person perspectives. Fists, swords, maces, blackjacks, daggers, and much more give you tremendous options to pick the right weapon for the job. Meanwhile, period period-appropriate-weaponry with skill-based active reload systems include flintlock pistols, muskets, blunderbuss, and more — just be sure to keep your powder dry! Claim What’s Yours – Form a company, claim territory and apply taxation and behavior rules to that which you own: be a benevolent governor, a feudal lord, or a ruthless dictator. Territory ownership is visualized on your dynamic zoomable World Map, with Fog of War obscuring uncharted regions and Shroud of War hiding enemy territories out of sight range. Contest other government’s ownership of land, structures, or ships to expand your empire! The top large-scale Spheres of Influence on the Official ATLAS‘ are visualized in real-time on the PlayATLAS.com website. Design your own custom flag per-pixel to apply to your claims, to be famous (or infamous)! Creatures Great and Small – More than 50 creatures at launch varying from breedable utilitarian farm animals & shoulder mounted parrots and monkeys that offer unique buffs, all the way to magical mermaids and gigantic sea monsters of legend. Creatures can be found in their logical regions, but take skill and tactics to tame using new mechanics, while also gaining the most benefit and fertility from their natural biomes. Ferry these temperamental creatures across the vast oceans in a virtual Noah’s Ark to trade in exotic locales. Freeports to Meet & Greet – Level-capped starter zones allow you to learn the ropes and meet new players in a safe space before you venture out into the great unknown. Where the wind and destiny takes you beyond that, is up to the gods! Build Your Empire – Overhauled building systems include automatic foundational elevation adjustment, dynamic tile type swapping, improved snap detection & previewing, integrated plumbing systems, per-pixel-paintable everything, beast-of-burden harness attachments for field-gun and carriages, and much more! Survival systems newly include, among other aspects, Vitamins benefits and deficiencies, with recipe & cooking skills and varying ingredient qualities. Powerful Mod and Server Functionalities – Want to build a World War II Spitfire? Or a Flying Fortress bomber with fully walkable interior and gun stations, carrying troops loaded with machine guns and rocket launchers? How about a Tank? An Aircraft Carrier to play out the Battle of Midway on an expansive scale? How about an Arcadian Steampunk Airship floating through a cloud-world? These examples and much more are provided with the ATLAS Dev Kit, where you can make effectively create whatever large-scale MMO action game you want to see happen, all supported by the database-driven network technology that powers ATLAS. Unofficial ATLAS’ can be of any size and configuration, while a visual map tool lets server hosts layout their own complete custom world of islands, continents, terrain features, spawns, resources, hazards, underwater zones, dynamic weather, biome configurations, ecology, and an infinite number of other configurable features — all dynamically streamed to the client during gameplay. The possibilities are endless! Far, Far More – Stay tuned for more details on the extensive features and content of ATLAS. This brief sampling is just the tip of the iceberg (though be sure to watch out for those in the polar regions, as they’re extremely dangerous to ship hulls!!). A Brief History of ATLAS – Long-ago, far above the watery world of ATLAS there once existed a magic-powered “Golden Age”– where great Empires of the Sky lived at peace alongside magical creatures, flourishing upon floating continents above the clouds, all powered by a magical source of energy known as the Heart of the Goddess, granted by the powerful beings who dwell in the stars beyond. However, a powerful warlord known as Xevos sought to unite the human civilizations over the magickind, and launched a war that broke the Heart into pieces, unleashing a wave of destruction that shattered the floating landmasses and plunged them into the waters below.